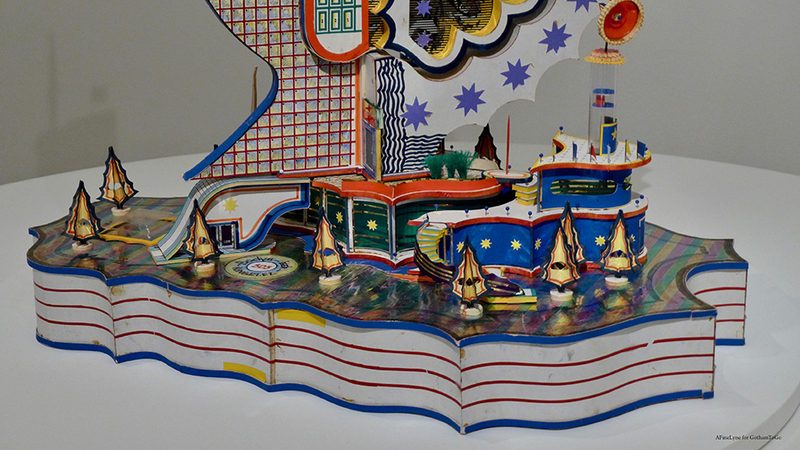 A wishful model of Kingelez’s own home village, reimagined. 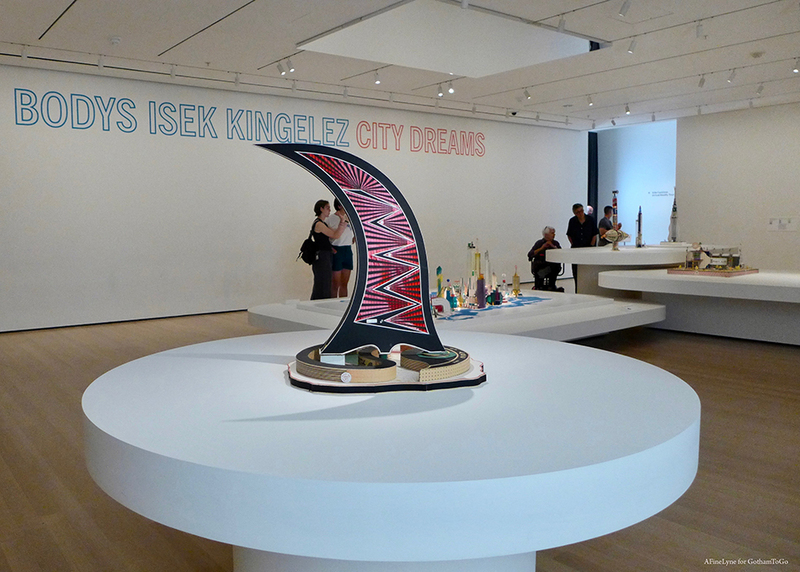 Bodys Isek Kingelez was born in what was, in 1948, the Belgian Congo. After graduating from secondary school, he supported himself by teaching, and by working as a restorer of tribal masks at the National Museum in Kinshasa. It was during this time that he began to create some of his first works. 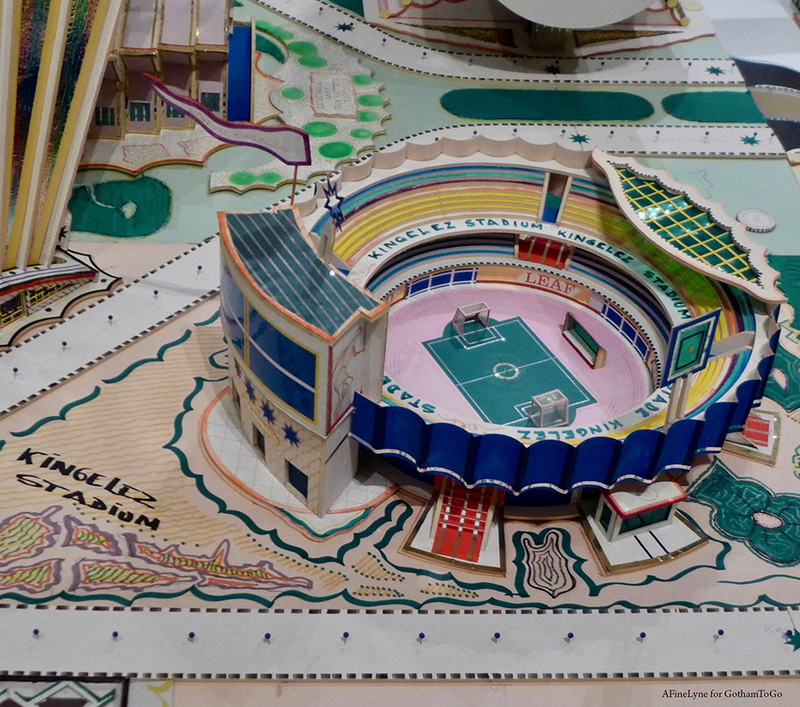 In the above model, Kingelez reimagines his own agricultural home village ~ Kimbembele Ihunga (1994) with a soccer stadium, banks, restaurants, and skyscrapers! All of which was a complete departure from the reality of a town lacking in all of these amenities. Kimbembele Ihunga was his first model of a city. 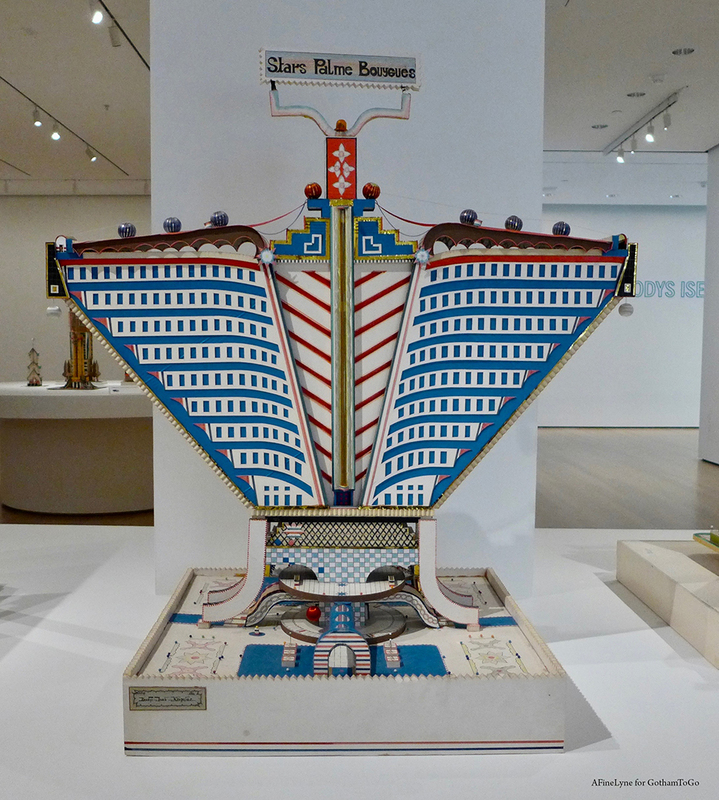 By 1985, he was working full-time as an artist, and in 1989, he was invited to Paris to present his work in a group exhibition entitled Les Magicians de la Terre. 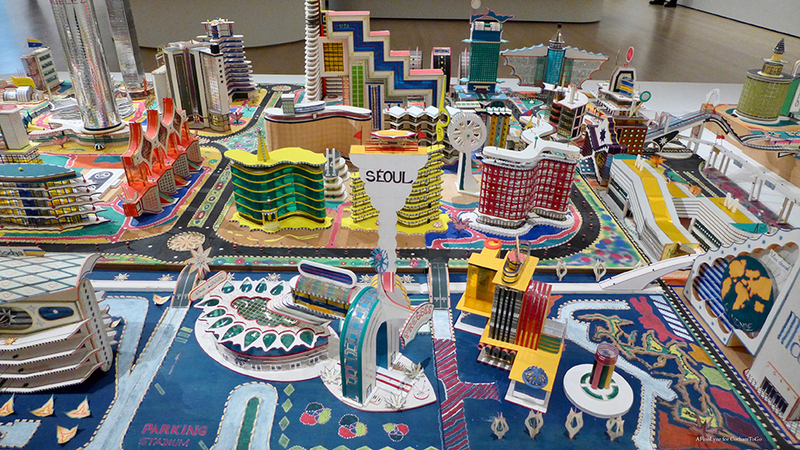 He went on to create many such imaginative urban cities, reflecting dreams for his country, his continent, and eventually, fanciful, wishful cities around the world ~ his utopian models for a more harmonious society of the future. 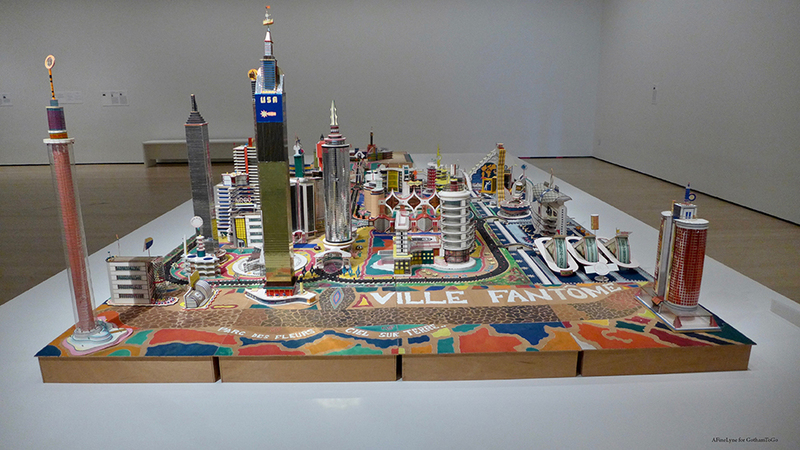 The exhibition Bodys Isek Kingelez: City Dreams spans the three-decade career of this visionary Congolese artist whose words were as potent as his art. Above, model is entitled Ville de Sete 3009, 2000, a French port city where he did a month-long residency, staying at Hotel Azur. 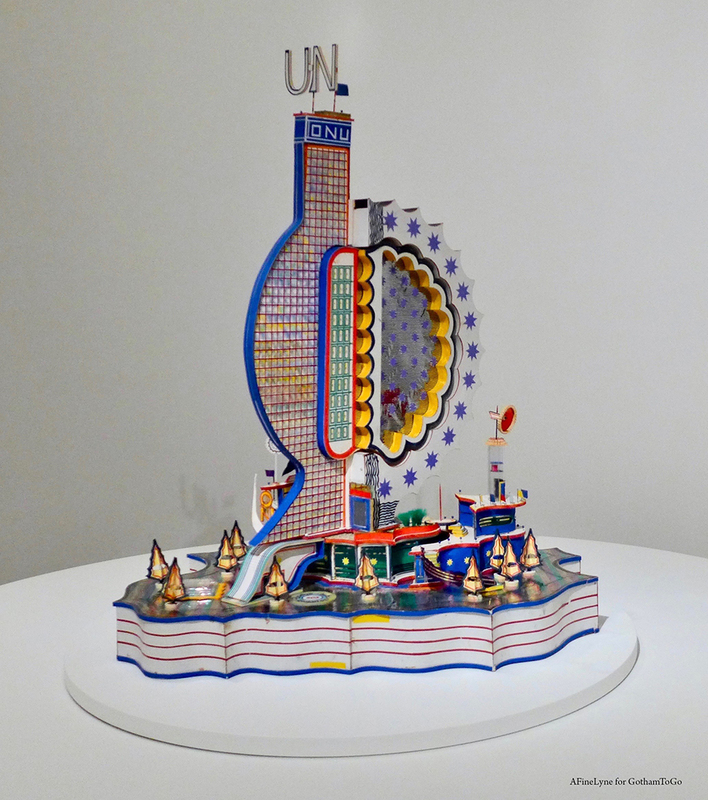 This is the only work in which Kingelez incorporated electric lights. 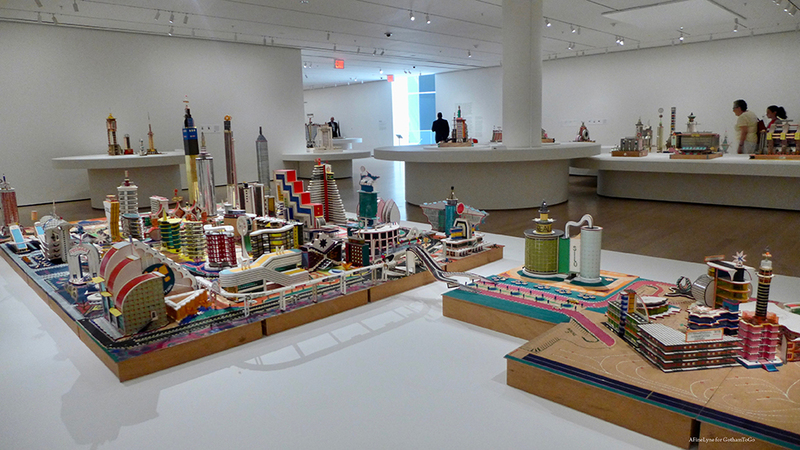 The models were created from a wide array of everyday materials and found objects including colored paper, commercial packaging, plastic, soda cans, and bottle caps. In addition to his piece on The United Nations, works in the exhibition also include The Scientific Center of Hospitalisation the SIDA (1991) referencing the AIDS crisis, and Palais d’hiroshima (1991) addressing the condition of postwar Japan. 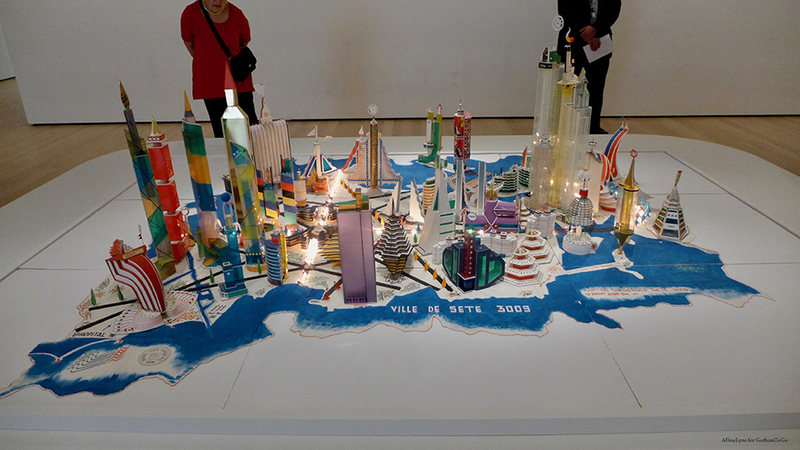 The model above, Stars Palme Bouygues, was inspired by his six-month stay in Paris in 1989. 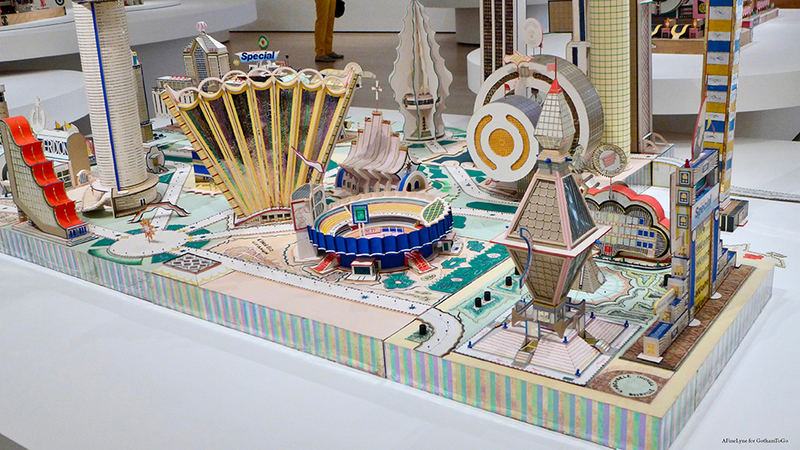 It references the Grand Arche de la Defense, a landmark built for the bicentennial of the French Revolution, and inaugurated while Kingelez was there. The above model, Place de la Ville, is a city square lined with composites of the Zairian flag. A bright red placard proudly displays the letters MPR which stand for Movement Popular de la Revolution, Zaire’s ruling political party. The model above, left – Etoile Rouge Congolaise, 1990 is topped with a red star, representing the artist’s socialist ideals for society. 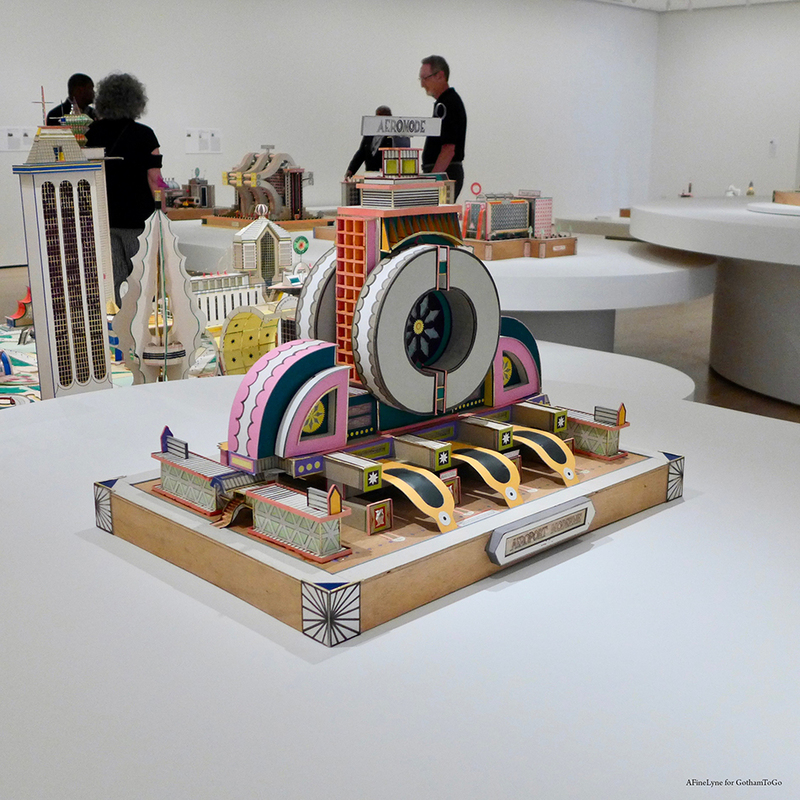 This piece was dedicated to the citizens of the Republic of the Congo, and houses what he called the “High Multicultural Court of Wisdom” where art and knowledge contribute to humanity’s well-being. Below, Aeromode is his highly efficient modern airport, designed for the next century. 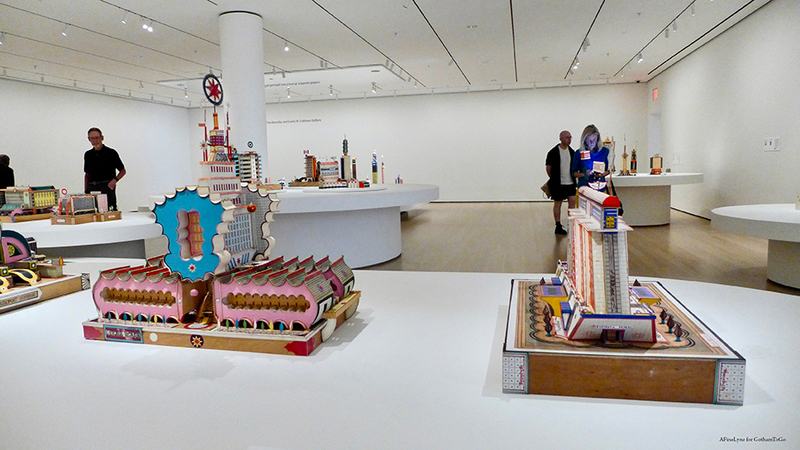 In all, MoMA is exhibiting 33 models by Body Isek Kingelez in the exhibition Bodys Isek Kingelez: City Dreams, organized by Sarah Suzuki, Curator, with Hilary Reder, Curatorial Assistant, Department of Drawings and Prints, The Museum of Modern Art. 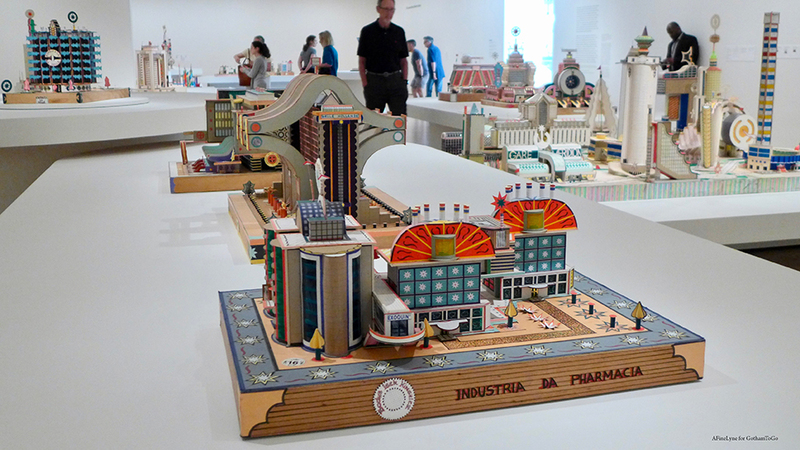 The exhibition design is produced in collaboration with the artist Carsten Holler. 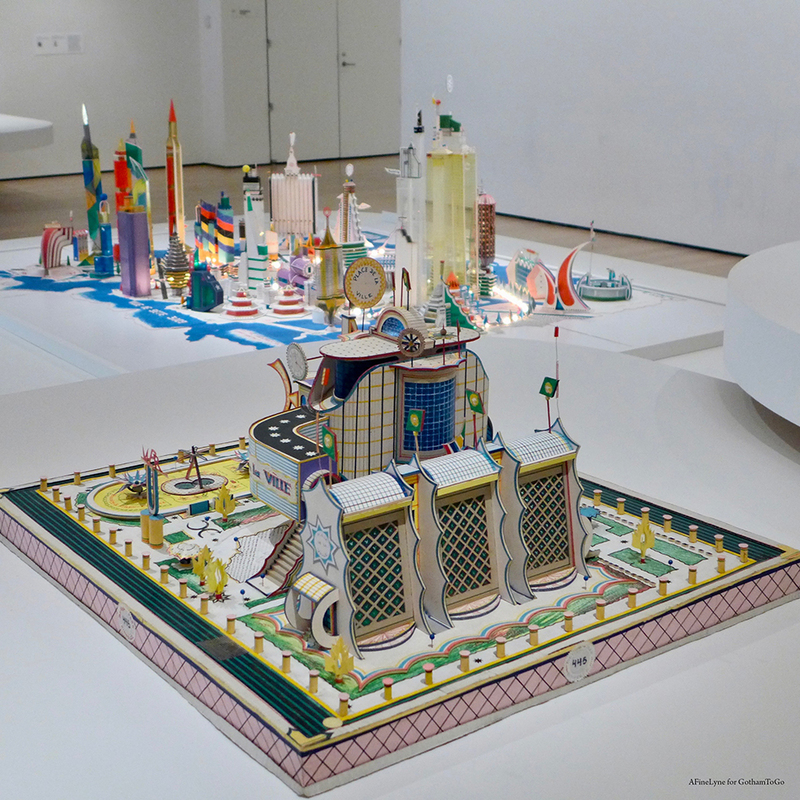 City Dreams will be on view to January 1, 2019 at Museum of Modern Art, Floor three, The Philip Johnson Galleries. 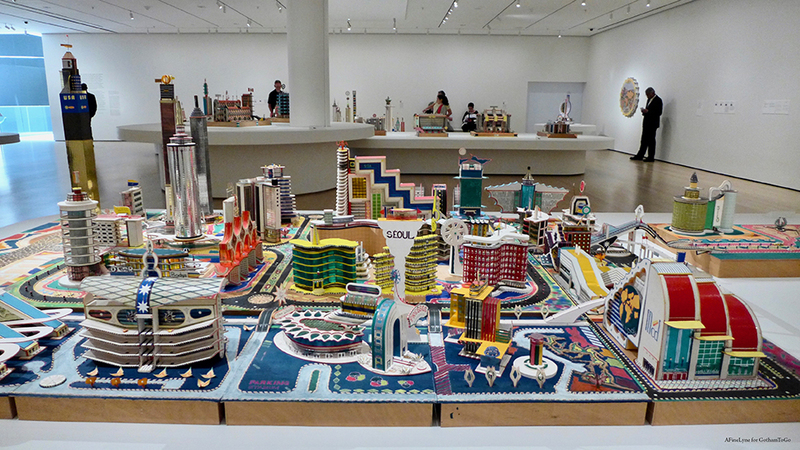 In an adjacent room, the documentary Kingelez: Kinshasa, A City Rethought, 2003, continuously runs the 30-minute first-person account of Kingelez’s process, ethos, and life in Kinshasa. In keeping with the thought of reuse of found materials in art, save the date for The 8th Floor exhibition, Sedimentations: Assemblage as Social Repair opening on June 21, 2018.